In his New York Times bestselling memoir, A Work in Progress, Connor Franta shared his journey from small-town Midwestern boy to full-fledged Internet sensation. 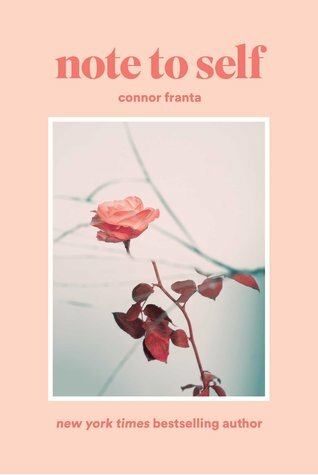 Exploring his past with humor and astounding insight, Connor reminded his fans of why they first fell in love with him on YouTube—and revealed to newcomers how he relates to his millions of dedicated followers. Now, two years later, Connor is ready to bring to light a side of himself he’s rarely shown on or off camera. In this diary-like look at his life since A Work In Progress, Connor talks about his battles with clinical depression, social anxiety, self-love, and acceptance; his desire to maintain an authentic self in a world that values shares and likes over true connections; his struggles with love and loss; and his renewed efforts to be in the moment—with others and himself. Told through short essays, letters to his past and future selves, poetry, and original photography, Note to Self is a raw, in-the-moment look at the fascinating interior life of a young creator turning inward in order to move forward. Is this the best way to make my last day of 2017 worthwhile? I picked Note to Self off the shelf which belongs to my younger sister. I was fairly excited when I knew this book was published early this year and to be honest, I thoroughly loved the first book Connor Franta wrote called A Work in Progress. I happened to be positive in the coming year and thought to read this book without meaning to. Just to get myself prepared for 2018 and be inspired by Connor Franta's writing! Note to Self reminds me of a diary containing lots of emotions all over and just venting it all out. I was expecting so much more from this book. I know Connor wanted to share all the feelings bottling up inside and reaching to his fans through the pages alone. I understand that but in some way I have to say it was simply just mediocre and the message it sent across can be a bit of self-pity and how to overcome that in some way or another. It also views his self-realization towards his life. In some area, I find that the artistic photography done and effort to come up with depth and meaningful poems was actually not bad. Although I could not say I had a connection to each of them. Perhaps, I was easily distracted and it does not sway me to put myself in the same shoes how the author might have felt at the time even though I completely understand his point of view - reasonable as it gets. Note to Self certainly did not connect with me in a special way that A Work in Progress did. It left me a bit of empty handed, to be honest. Can't find what you looking for on my blog? Easy search it below! UPCOMING BLOG TOURS - 2019! I'm on NetGalley reviewing ARCs!